The only notable Hindi offering of this week Chef has unfortunately opened to a dull note at box office. The movie has been released on decent number of screens i.e. 1570 across India and witnessed strong competition due to last week’s Judwaa 2 which is running smoothly. Directed by Raja Krishna Menon whose last venture was superhit Airlift, Chef is the official remake of American movie Chef which was released in 2014. The original one was received positive reviews from everyone because of rich content but unfortunately the Indian version is getting mixed reviews from critics. Being a remake it is predictable at most of the points, this might be the reason behind mixed reactions. Although most of the audience are looking satisfied with the movie, but still Chef remained dull throughout the opening day at box office. 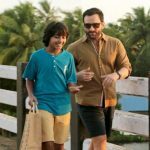 On Friday, Saif Ali Khan, Padmapriya Janakiraman and Svar Kamble starrer recorded low occupancy of around 10% across the country for morning shows and reported slight growth in footfalls over the evening and night shows at multiplexes. With overall 15% of occupancy, Chef raked the business of only 1.05 crore, while it was expected to collect in range of 3-4 crores at domestic box office. Due to weekend, the movie could take some growth over Saturday and Sunday but Judwaa 2 is not showing any sign of mercy. So let see what total 15 crores budgeted Chef will register at the end of this weekend opposite to Varun Dhawan starrer action comedy.